Cap: 10-30 mm in diameter, orangish brown to yellowish, convex but occasionally with a rudimentary papilla or umbo. Cultivated specimens sometimes exhibit an irregular edge. Stem: 50-110 mm long, fibrous and tough especially at the base, staining blue when cut. 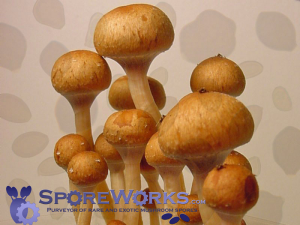 Gills: pale brown to yellowish brown to dark purplish black with spore maturity. Spores: 6.5?8 microns in length, rhomboid to subrhomboid in face view, dark purplish brown in deposit. Comments: This collection is a direct descendant of cultures made by Heim and Cailleux in 1958 and featured in the historically significant ?Les Champignons Hallucinogenes des Mexique? (Heim & Wasson, 1958). 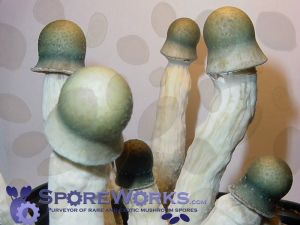 Initially described as Psilocybe semperviva, it was considered an interesting but mutated form of P. mexicana (Heim & Wasson, 1958; and Heim and Cailleux 1958). However, unlike P. mexicana this species does not form sclerotia in culture. 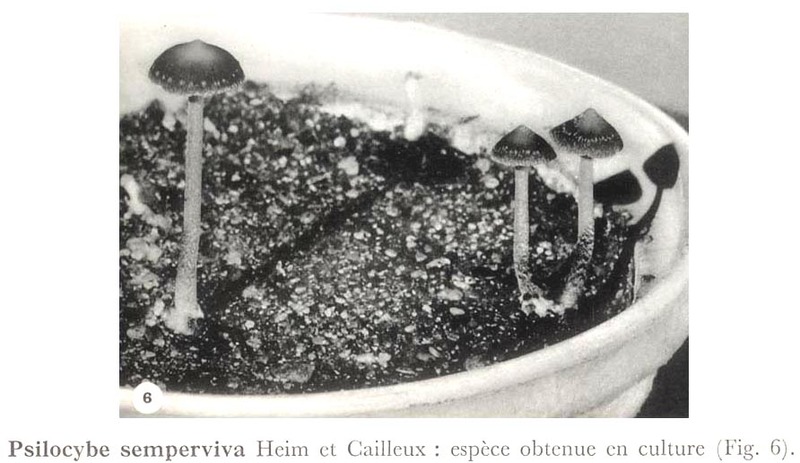 Later, Heim (1967) curiously described P. semperviva as being a wild mushroom from Huautla de Jimenez. 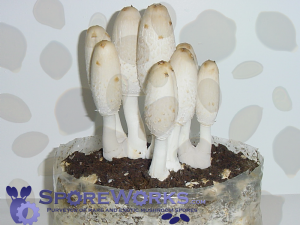 It has been noted as slow growing and highly resistant to contamination and decay, which explains the descriptive name ?semperviva? which means ever-living. This is especially appropriate considering that this sample was originally collected over 50 years ago and is still going stong. Guzm?n (1978) eventually determined that P. semperviva is actually a nonpapillate variant of P. hoogshagenii and is now known as P. hoogshagenii var. convexa. Guzm?n, G. 1978. Further investigations of the mexican hallucinogenic mushrooms with descriptions of new taxa and critical observations on additional taxa. Nova Hedwigia 29: 625-644. Guzm?n, G. 1983. The Genus Psilocybe. Valduz, Germany: J. Cramer. Guzm?n, G. 1995. 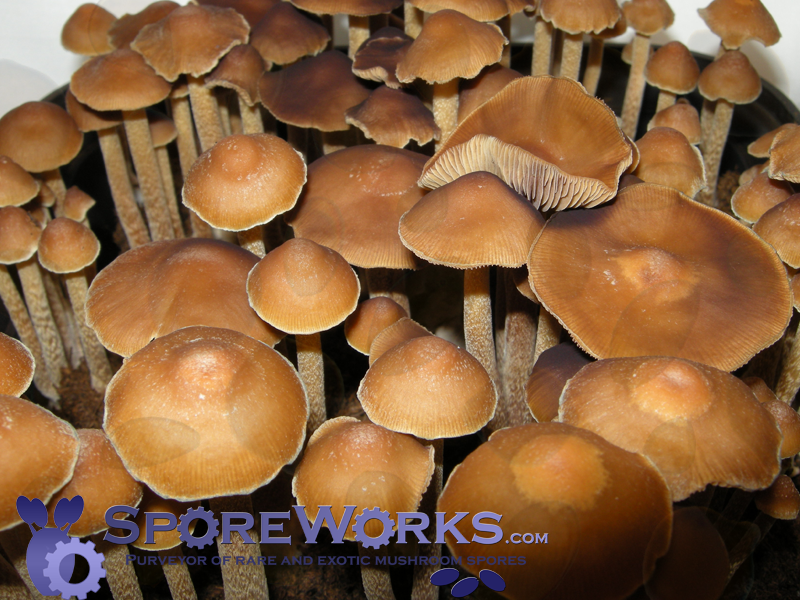 Suppliment to the monograph of the Genus Psilocybe. In Taxonomic Monographs of the Agaricales. Eds. O. Petrini and E. Horak. Bibliotheca Mycologica 159: 91-141. Heim, R., 1967. Breves diagnoses latinae novitatum genericarum specificarumque nuper descriptarum. Rev. Myc. 32: 203-210. Heim, R. and R.G. Wasson, 1958. Les champignons hallucinogenes des Mexique. Ed. Mus. Nat. d?Hist. Nat., Paris.